Five Southern District clergy attended the annual Black Clergy Caucus in Chicago, IL, April 30th through May 2nd. St. Paul Lutheran Church of Chicago was the host church. Rev. Warren Lattimore (standing, middle, 3rd row), Rev. Jerome Terry (two right of Lattimore, same row), Rev. Aubrey J. Watson Jr. (third from right, same row), Rev. Dr. Ulmer Marshall (standing, left, back row), and Rev. Dr. McNair Ramsey (seated, left, front row) attended from the Southern District. Rev. 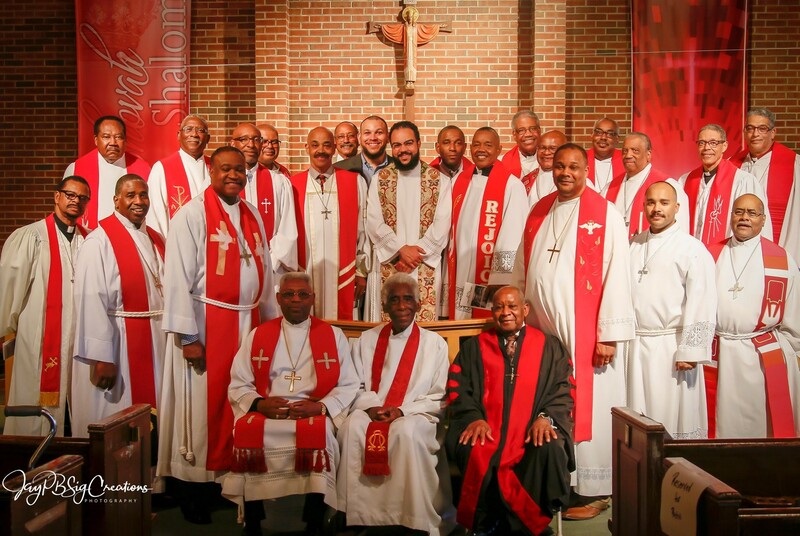 Lattimore was elected as President of the Clergy Caucus, and Rev. Watson was elected Assistant Secretary. The BCC expressed its thanks and appreciation to Rev. Terry for his six years of service as Treasurer. Also pictured: Black-African American Ministry LCMS Executive Director, Rev. Dr. Roosevelt Gray (standing, third from left), Rev. William Griffin, Emeritus (seated, middle), as well as President of the Board for Black Ministry and present Black Family Convocation Coordinator, Rev. Dr. Bryant Clancy (robed in black).